Priced to Sell - This 36’ Cruiser is like new with just over 100 hours on twin 5.7 MPI Crusader engines. It has a spacious salon where there is a 2-Zone-AC unit with reverse cycle heat, and a 21" flat screen panel TV with a DVD player also included is a 6-disc CD player with separate controls at the helm station. The master stateroom includes a queen berth and an additional 15" flat screen TV. In the cockpit there is a wet bar with refrigerator/freezer. At the helm station there is a GPS-color chart plotter, depth gauge, compass and VHF radio. There is full canvas cockpit cover and seat covers. This boat is exceptionally clean and well maintained. 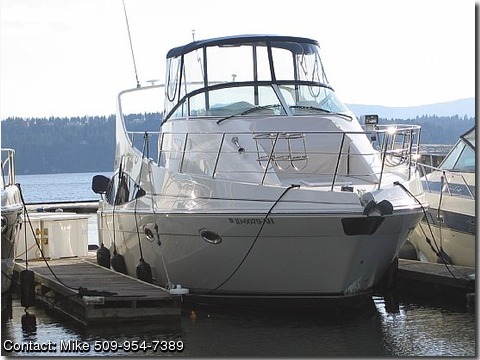 Comes with a leased slip at Silver Beach Marina on Lake Coeur d' Alene, Idaho.